WASHINGTON (Reuters) - South Korea will make a "major announcement" on North Korea at 7 p.m. (0000 GMT) on Thursday, after South Korean envoys who met with North Korean leader Kim Jong Un this week briefed U.S. officials at the White House, U.S. President Donald Trump told reporters. Trump made the comments to reporters in the White House briefing room but he gave no other details. 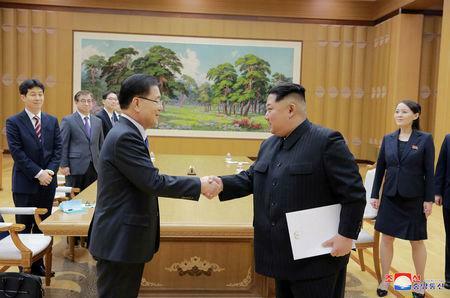 South Korea's National Security Office head Chung Eui-yong and National Intelligence Service chief Suh Hoon flew to Washington to explain North Korea's stance on possible future talks with Washington and the prospect of Pyongyang suspending nuclear tests if the security of the North's government is assured. CNN quoted a foreign diplomatic source as saying that South Korean officials had delivered a letter to Trump from Kim. Fox News quoted an unidentified U.S. official as saying that Chung would announce an invitation from Kim to meet Trump, no change to planned U.S.-South Korea military exercises in April, and a North Korean commitment to stop nuclear and missile testing. Reuters could not immediately verify these media reports. 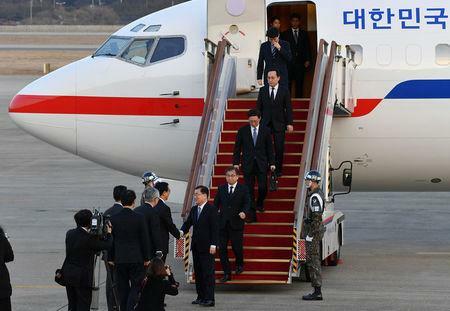 A South Korean presidential official said he was not aware of any physical letter. White House spokeswoman Sarah Sanders said only that Chung would make the announcement on North Korea. But at the White House, there was a growing recognition that the North Korean offer for talks and South Korean desire to have them had put the United States under pressure to talk to the North, and that unless North Korea resumed aggressive activity like missile launches, Washington would likely take up the offer, a senior U.S. official said. 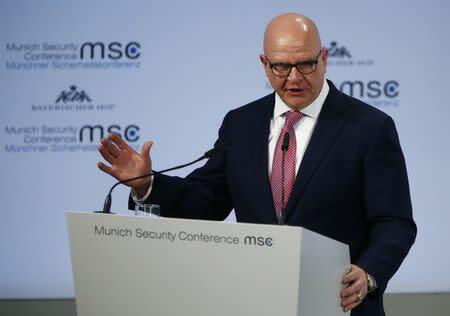 The South Korean officials, who met Kim on Monday in Pyongyang, met a large group of U.S. administration officials, including National Security Adviser H.R. McMaster, Defense Secretary Jim Mattis, Director of National Intelligence Daniel Coats and officials of the U.S. Treasury. A South Korean Presidential spokesman said the delegation would also meet Trump. The growing focus on diplomacy has helped ease fears of war in a standoff over North Korea's development of nuclear missiles capable of hitting the United States. As U.S.-South Korean talks got under way, State Department spokeswoman Heather Nauert told reporters: "We will see what comes out of that meeting today and we may have announcements at some point." Monday's talks with Kim were the culmination of a series of North-South contacts since the beginning of the year.